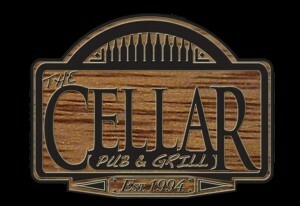 I had never been to The Cellar, the pub on the UNB Fredericton campus, before Tuesday night. In fact, until recently, I didn’t know there was even a bar in the Student Union Building. However, upon discovering that there was going to be a Poetry Slam Competition, I decided that it may be a place I should check out. Although I was somewhat unimpressed with the venue (simply because bars and pubs aren’t usually my favourite places to be), it was still a fairly cozy place despite the noise and the alcohol going around. The atmosphere was good and the servers were friendly. I arrived early with a friend and waited until the start of the show. The poetry slam was sponsored by STUART and The Cellar, and was judged by Paddy O’Reilly (last semester’s Slam winner), Emily Bosse (a UNB grad student), and one randomly chosen judge. Although I don’t remember the names of all of the competing poets, I was incredibly impressed with the display of talent from everyone who competed. In the first round, all competitors read one poem and were then judged and half of which were eliminated. 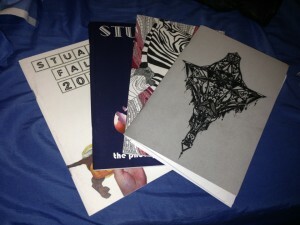 Those who weren’t continued to the second round, read another poem, and won a copy of STUART, STU’s student arts publication. From there, two final competitors were chosen and were given 15 minutes to write a final poem on two randomly chosen phrases: restraining devices and supplements. The winner of the competition was Kirk Girouard, winning a prize of $100. Those I do remember where Jeremy Fowler, who did a poem from memory while Kirk held the microphone, and Cody Jack who wrote a love poem about his beard (wonderful). After the show, they held an open mic for anyone who wanted to read, where a few of the competitors read another poem, and a man named Weston advertised the Open Mic every Tuesday night at the Grad House. Maybe I should have read something, but with my on-stage jitters, I had decided against it. Overall, it was a fantastic night and I was thoroughly impressed by everyone who competed or read for fun in the open mic afterwards. I’ll have to attend more of these in the future (although I wonder if the slam would have been different on a Friday night… considering it was in a pub?). Congratulations to all of the competitors and the winner, Kirk. My sincerest apologies if I’ve spelled someone’s name wrong – please let me know and I’ll be sure to edit them! Excellent! Sounds like a fun night. Jeremy is another one of our members too, he has two shows on the air. I like that the first round of poets that didn’t move on got prizes, very cool!